Drum along to your favorite Weezer hits with this fun and intuitive learning tool. Weezer is a seminal alternative rock band from Los Angeles. Included in this drum book/CD are such hits as: "Undone - The Sweater Song," "Hash Pipe," and "Say It Ain't So." 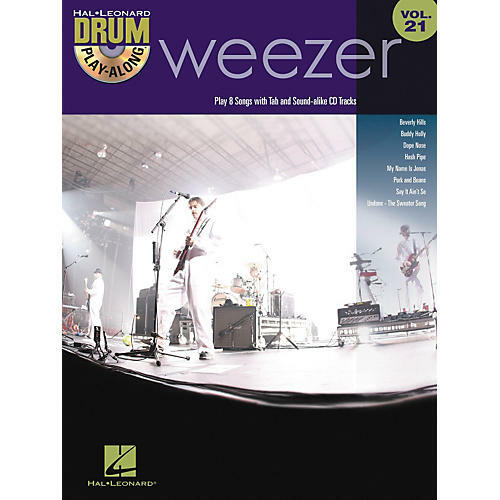 This Weezer Play-Along drum book/CD will help you play your favorite Weezer songs quickly and easily. Just follow the drum notation, listen to the CD to hear how the drums should sound, and then play along using the separate, sound-alike backing tracks. The lyrics are also included in the book in to help you follow along. The audio CD is playable on any CD player, and is also enhanced so PC and Mac users can adjust the recording to any tempo without changing pitch.